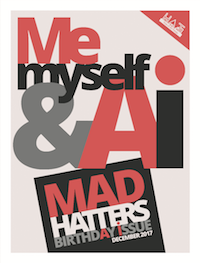 One year ago, we started the MadHATTERs weekly magazine. Since then, we never missed a single issue! This month, we celebrate our one year old birthday by coming out with a special issue - available online and in a printed tabloid version! Enjoy! View and subscribe to our weekly magazine. Want some physical copies of this issue to help us spread the word? Email us at contact@hatdex.org with an address!